Winter air is very dry, and most likely you have begun to see the effects already – chapped lips, stuffy nose or electric shocks after walking across the carpet are all signs of low humidity levels. Adding moisture can make a difference in the comfort level of your house, and a humidifier is a good way to do that. One option is with a whole home humidifier, but this may or may not be the right choice for you. Increased humidity levels in your home offer a number of benefits to you and your family. Humid environments can reduce the risk of infection by viruses, and provide faster healing times when you do get sick. Humidity also leads to softer, healthier skin, provides nourishment for houseplants, and benefits wood furniture by keeping it from drying out and cracking. A whole home humidifier is a device that is installed on your furnace, and connected to the home’s water supply, with the purpose of adding moisture into the air and increasing humidity levels. As air passes through the furnace, it picks up moisture along the way through the water that has been collected by the humidifier, and is distributed through the home through the duct system. A whole home humidifier provides the added moisture that helps to alleviate dry skin, health issues and cracking furniture, but this type of humidifier provides comfort to the entire house, as opposed to the smaller units that would cover only individual rooms. They typically require little maintenance and automatically adjust the humidity levels in the house, thus keeping comfort levels consistent. Low humidity levels in a house can be a sign of other problems, like excessive air leakage from places like the attic, windows or fireplaces. Turning up the humidifier may simply mask the problems, and therefore they may not get addressed properly. They can also lead to mold growth in your home, which can have unhealthy consequences. 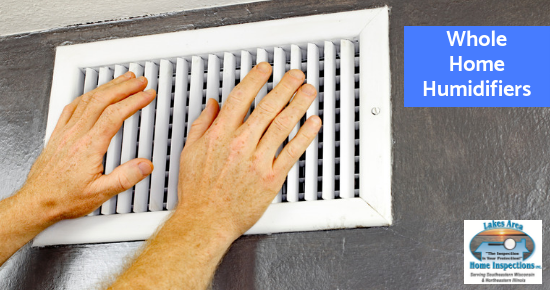 The air quality inside your home is a big factor in your overall living comfort. When we perform our inspections, we are on the lookout for issues that may negatively affect your quality of life in a home. Your home inspection is designed to give you peace of mind when purchasing a home, and our detailed reports will provide you with important information about a home’s condition. Call Lakes Area Home Inspections at 262-818-0911 for information about our thorough inspection services.